just a quick try with a template they have. we need to get a shorter address. ok.i will see what i can do about the link.Thats a good idea for advertisement to. did you have any luck with those cards? what do you guys think. I kinda ran with brendend's idea. I added njstanger to the bottom as a sister website. I didn't want to step on any toes and plus i figured it would help both sites grow. Let me know what you guys think so i can order them. i ordered them up hopefully they'll be here before the cruise. I hope to have them by the cruise. Well I just got them them in today and they look great. Just need to hand them all out now lol. How did those cards make out? 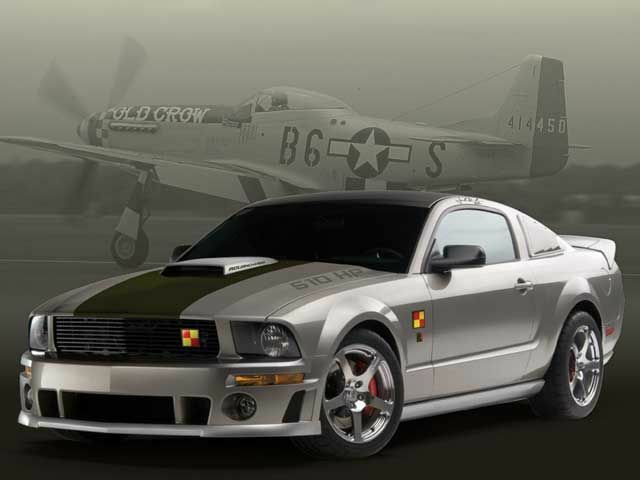 i knew a few people with really nice stangs who are up for it, so if we can get a head count here. The cards came out really good. As for organizing something set date and get things going. Im up for it. how you makin out with that? what did you get adjustable cam gears? lol well get on it so we can have a group meet and get this site rolling. 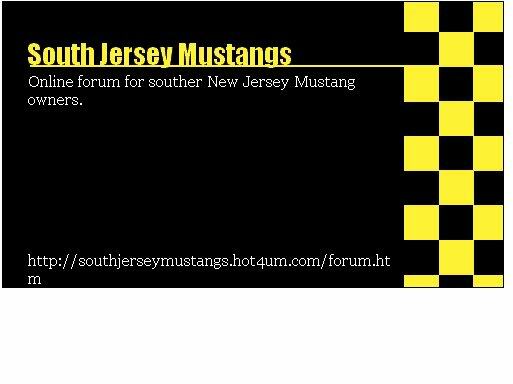 small problem, we need to come up with a new name, south jersey mustangs is taken already. so PM me ur ideas for a name for this club. 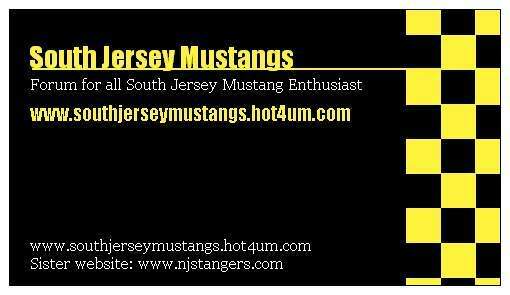 How about just South Jersey Stangs. 26 Re: Idea for advertising!! !